Yippee! I just bought myself a breadmaker for $25! The lady only used it once or twice. It's been something I've been thinking about getting for some time now.I really made the decision today though after I bought my second loaf of gluten free bread and had to pay almost $8 for it! I've been having gluten intolerance problems and with me being a big bread eater, I felt like I should maybe start trying to eat more gluten free. Thing is, living in a small town, only one grocery store carries it and it's so costly.So, I put my foot down, spent the $25 birthday money my sister gave me,( my birthday's on Sunday), and bought a bread maker from our Facebook's online buy and sell.So happy! 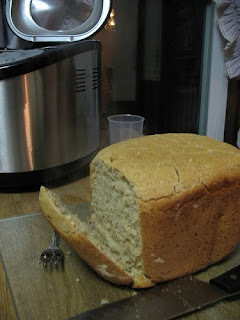 I am looking for any good and simple, bread machine gluten free recipes to try though. For breads or loaves, so please send me anything you have.If you have site links, please feel free to add them in the comments. A breadmaker?! Woah, that sounds really cool.